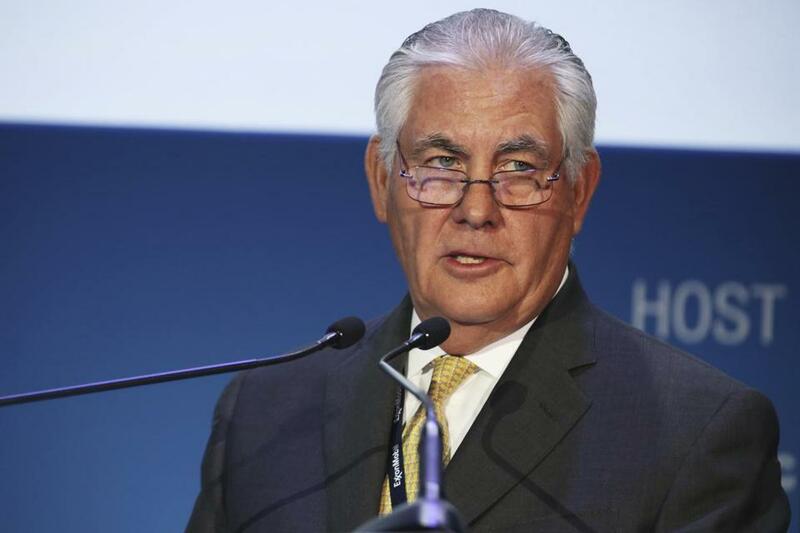 ExxonMobil CEO and chairman Rex Tillerson in November. WASHINGTON — Democratic senators plan to aggressively target eight of Donald Trump’s Cabinet nominees in the coming weeks and are pushing to stretch their confirmation votes into March — an unprecedented break with Senate tradition. Incoming Senate Minority Leader Charles E. Schumer, of New York, has told Senate Majority Leader Mitch McConnell, of Kentucky, that Democrats will hone in especially on Rex Tillerson, Trump’s choice for secretary of state; current Senator Jeff Sessions, an Alabama Republican who’s Trump’s choice for attorney general; Representative Mick Mulvaney, a South Carolina Republican tapped to lead the Office of Management and Budget; and Betsy DeVos, set to serve as education secretary. There’s also Representative Tom Price of Georgia, Trump’s pick to lead the Department of Health and Human Services and oversee changes to Obamacare, who is set to be attacked by Democrats for his support for privatizing Medicare. Andrew Puzder, a restaurant executive set to serve as labor secretary, will face scrutiny for past comments on the minimum wage, among other policies. Steve Mnuchin, a former Goldman Sachs partner set to serve as treasury secretary, and Oklahoma Attorney General Scott Pruitt, Trump’s pick to lead the EPA, will also be the focus of Democratic attacks, aides said. Absent from the Democratic hit list are retired Marine General James N. Mattis, set to serve as defense secretary; Governor Nikki Haley of South Carolina, who Trump has nominated to serve as ambassador to the United Nations; and John Kelly, a former Marine general and Trump’s selection to lead the Department of Homeland Security, signaling that all three should expect little trouble from Democrats. Senate confirmation hearings are scheduled to begin next week, when the Judiciary Committee is set to hold two days of hearings with Sessions, and the Foreign Relations Committee is scheduled to hold a one day, two-part hearing with Tillerson. But Schumer has told McConnell that he wants at least two days of hearings for each of these eight nominees, including at least one panel made up of witnesses that can speak to the pick’s past record, aides said. At each hearing, members of the committee would get at least 10 minutes to ask questions, with no limits on multiple rounds of questions, if requested. Democrats also want hearings for each of these eight nominees to be held on separate weeks, with no more than two Cabinet picks sitting for a hearing in the same week. That would mean that Tillerson and Mattis’s hearings could happen in the same week, but not the hearings for Price and Mulvaney, aides said. That’s already not set to happen and Republicans have scoffed at Schumer’s proposal, noting that the New York senator went along in 2009 when the Senate unanimously confirmed seven of President Obama’s Cabinet nominees on Inauguration Day and five more later that week. Despite early vows to cooperate with Trump and his new government, Democrats have been troubled by a lack of personal disclosure by Cabinet choices that they say mirrors Trump’s refusal to disclose personal financial information during the presidential campaign. Tillerson angered Democrats this month when he told the Senate Foreign Relations Committee that he stood ready to provide only ‘‘tax return information’’ for himself and his wife for the previous three years. That means it’s possible Tillerson isn’t willing to provide complete tax returns - a break with past nominees. The ‘‘unprecedented’’ personal wealth of Trump’s nominees warrants the delays, one senior Democratic aide said. One other potential stumbling block: Nominees are required to obtain certification from the Office of Government Ethics before a confirmation vote, something most Obama-era picks had achieved before their confirmation hearings. So far, Democrats say, most Trump picks haven’t done so.